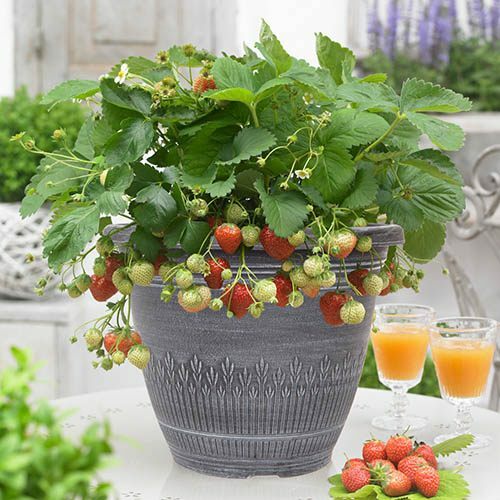 A premium planter set with one of the best strawberry varieties available. An eye-catching and productive feature for your garden - a 'wheat bundle' planter set with three established Elsanta strawberry plants. 'Elsanta' is one of the tastiest and most popular varieties of strawberry that you can grow at home - ready for picking in just a few short weeks. Perfect for growing in patio pots and containers when you’re short of space, and fruiting up until around the middle of July – weeks-worth of mouth-watering fruit! The reproduction silver effect planter combines good looks with functionality and will last for years, meaning that you can use them over and over again. The stylish wheat design has been brush painted to give an aged metallic look, creating the impression that you have a much more expensive planter. The perfect planting companion for Elsanta, both pot and plant bring out the best in each other, creating a fruitful, designer-style effect in no time at all. Create an eye-catching and productive feature for your garden with this stylish 'wheat bundle' planter set with three established Elsanta strawberry plants. 'Elsanta' is one of the tastiest and most popular varieties of strawberry that you can grow at home and one of the leading commercial varieties, favoured for their juicy fruit and earlier, heavy cropping. Perfect for growing in patio pots and containers when you’re short of space, the plants are in flower with fruit already setting and will be ready for picking in just a few short weeks - continuing up until around the middle of July – weeks-worth of mouth-watering fruit! Not only does 'Elsanta' produce bright and shiny orange-red fruits, but it produces pretty little flowers in the spring and rich deep-green foliage creating a very pretty ornamental plant in between fruiting seasons. The reproduction silver effect planter, is lightweight polypropylene and made with gardeners in mind, so you'll find that they combine good looks with functionality, having raised drainage holes and an internal reservoir to keep moisture in your pots for longer. Plus, as they're UV and frost resistant, they'll last for years, meaning that you can use them over and over again. The stylish wheat design has been brush painted to give an aged metallic look, creating the impression that you have a much more expensive planter, and is a decorative feature in its own right which you can use for many years to come. They're the perfect planting companion for Elsanta, where both pot and plant can bring out the best in each other, creating a fruitful, designer-style effect in no time at all. 3 Well established strawberry plants in a 27cm (11in) brushed silver effect, 'wheat bundle' planter. Pick your strawberries first thing in the morning, when fruit is at its juiciest, and pick only ripe red fruit as orange berries won’t have developed their full flavour. Pick the strawberries carefully, complete with their stalks and green calyxes. Strawberry plants need a good six to eight hours of full sun a day for optimal fruit production, so place your pot somewhere sunny. Strawberry containers should be watered daily and will need regular feeding (once a month until blooming) due to the limited amount of nutrients in the pot. Water regularly to prevent the plants drying out. When watering, try not to get the fruit wet. Feed your strawberry pot at least once a month until flowering and then every ten days with a liquid feed that is high in potassium and low in nitrogen. Fruit should be picked as soon as berries are red, if possible, in dry weather, taking care to leave the green stalk in place once fruit is picked.